The Moana Surfrider, A Westin Resort & Spa’s signature oceanfront restaurant, Beachhouse at the Moana, is the new home of master culinarian Colin Sato. 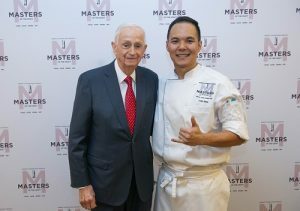 A month after being named chef de cuisine of the restaurant, the island-born chef became the first Hawai‘i chef to advance to the finals of Marriott International’s Masters of the Craft Competition. A monumental achievement, Sato bested some of the most talented culinarians in the state before moving onto the mainland to qualify for the finals by beating chefs in sectional and regional competitions in the culinary category of the Masters of the Craft Competition, Marriott’s competition for food and beverage professionals. In October 2018, Sato advanced to the final by virtue of his win in the national semi-finals at the Bethesda North Marriott Hotel & Convention Center, where eleven masters of craft in Culinary and Beverage were chosen to compete. For the final challenge, Sato created a salmon and butternut squash dish. Over 2,200 food and beverage virtuosos at Marriott properties in the U.S., Canada and Central and Latin America competed over a span of two months during internal competitions. After graduating from Saint Louis School in 2003, Sato got a true taste of the industry when he got a job as a busboy at a small restaurant, where he wound up working in the kitchen instead. 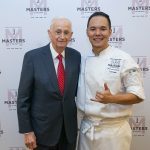 He went on to work as a dishwasher/pantry worker at the former L’Uraku Restaurant while he studied culinary arts at Kapi‘olani Community College (KCC). While studying at KCC, Sato won the Tom and Warren Matsuda Scholarship Competition hosted by Chef Roy Yamaguchi; he also won Pamela Young’s Mixed Plate Cooking Competition. Sato cites Chefs Alan Wong and Wade Ueoka as those who influenced him in his career, and helped to change the way he looked at food. According to Sato, both Chefs Wong and Ueoka always asked the up-and-coming Sato how he could make a dish better, and encouraged him not so settle, but to always strive for greatness. Following his graduation from KCC, he began working at a variety of restaurants including L’Uraku, 3660 On The Rise, Alan Wong’s, Trump Waikiki, The Modern Honolulu and Momo Burger food truck. He started at Azure Restaurant, the culinary landmark at The Royal Hawaiian in late 2013. Under the mentorship of Executive Chef Colin Hazama, Sato honed his skills in the kitchen and was given opportunities to create new menu items for the Mai Tai Bar and Surf Lanai. When he’s not at work, he enjoys golfing or being with his dog, Momo and Choco. Sato also tries to cook for his girlfriend, who he names as his hero because she helps keep him in check and helps him balance work life with home life.